Provide high quality products and services based on excellent technology so as to earn trust and appreciation from the customers. 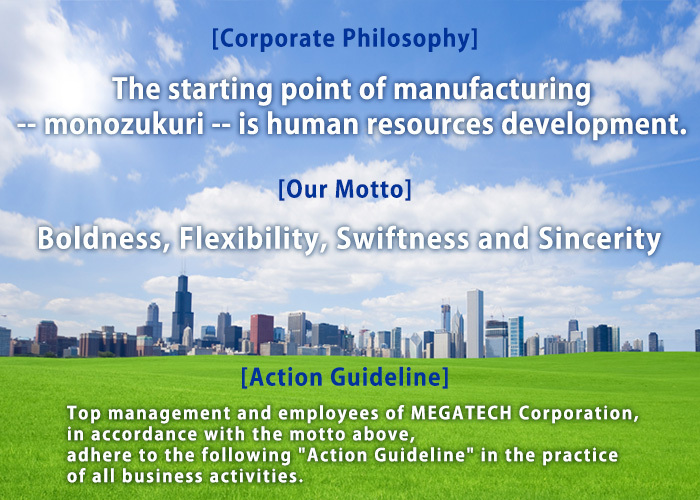 Collaborate and cooperate with the society and strive to actively contribute to it as a good business person. Possess a global perspective, respect different cultures and customs, and promote mutual understanding with various peoples of the world. Aim to exist in harmony with the earth and to build a comfortable society in which to live. Respect all the members of the society, including employees, as individuals and no discrimination shall be allowed in the course of conducting business activities. Provide an attractive, safe, comfortable and rewarding work environment for employees. Comply fully with laws and regulations, engage in fair and open competition and act with sincerity in accordance with sound business practices.